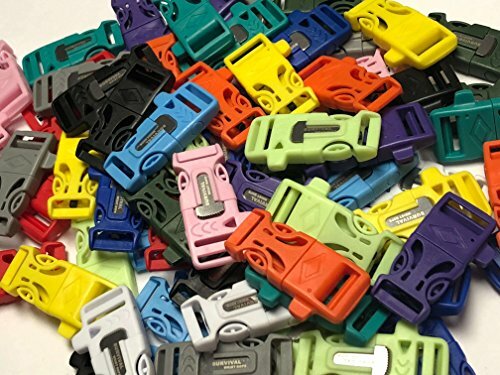 Our Multicolored Neon & Pastel Firesteel Buckles come with the emergency whistle and the fire starter & scraper all in one. These fire starter buckles should be part of your EDC in some form or fashion. ﻿This multicolored assorted set comes with a total of 15 buckles: Three Black, and one each in Royal Blue, OD Green, Glow in the Dark, Charcoal Gray, Neon Orange, Red, Pastel Pink, Baby Blue, White, Yellow, Turquoise, & Purple. The emergency whistle and the firesteel and scraper are included all in one. They are solid, tight survival buckles perfect for paracord bracelets, dog collars, etc. These will easily replace the buckles on your backpack. Always have a means to start a fire and call for help if needed all in one tool. Folks are loving them. Don't forget to stock up on Type III 550 Paracord to go with your firesteel buckles. If you have any questions about this product by Stockstill Outdoor Supply, contact us by completing and submitting the form below. If you are looking for a specif part number, please include it with your message.